Investing in the Stock Market is a mixed experience for many. For some it gives maximum profit, for some it gives loss. 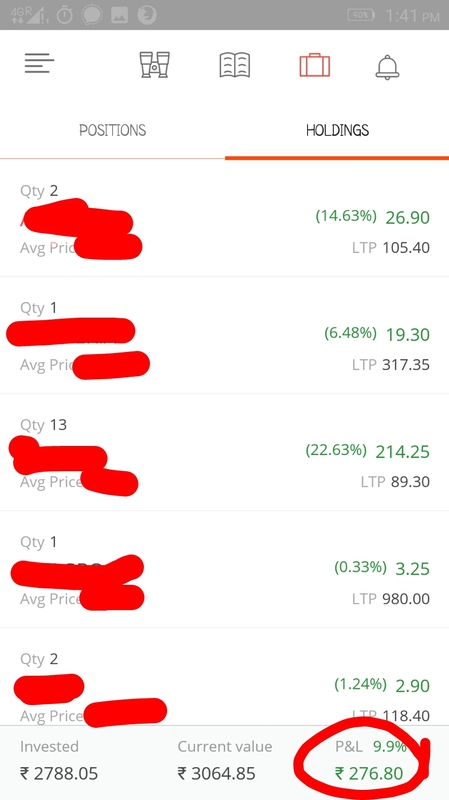 I’ve started experimenting in Stocks about a month back. I started buying little amounts of targeted stocks. Till now I was only into Mutual Funds. I’ve decided to take my investments up a notch. Following some good market strategies, I’ve been able to get good returns on my experimental stocks. I must say experimenting with small values has been quite good. I’ve got around 9% return in a month. Which is more than a months FD or SB A/c interest. Now I am planning to take things a little higher and buy some more targeted stocks. I will keep my blog posted about the stock returns I am getting. Overall, it has been a pleasant experience for me in the stock market. I believe I can definitely make good returns with the current strategy I am following in investing in stock market.